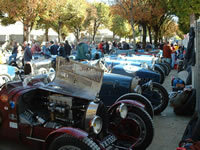 Since 2005 we have been organising our tour to attend the Circuit des Remparts vintage race meeting at Angouleme. A must for classic car enthusiastes and previous years have all been a sell out. 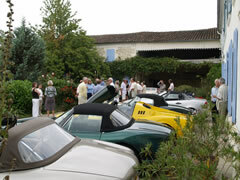 Join us the third weekend in September to explore the delights of the Charente Maritime and in particular, the excitement of the historic Circuit des Remparts classic car race held in Angouleme, when the town fills with racing enthusiastes for the annual gathering of vintage and classic cars. Modern safety equipment has replaced the hay bales and wooden fences but otherwise the circuit remains unchanged since the first race in 1939. Arrive on Thursday afternoon to welcome tea/coffee and home made cakes. In the evening enjoy aperitifs and a welcome 4 course dinner with wine, coffee & Cognac served in the Manor House. Friday, take time out to enjoy a guided tour of the Chateau and Cognac tasting at Baron Otard before exploring the town of Cognac. 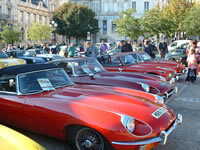 In the evening drive into Angouleme to watch the Concours d'Elegance - the cars gather in the centre of town for the judging of both the cars and their occupants, dressed in style. Choose from a great variety restaurants for dinner. On Saturday morning, we return to Angouleme for coffee & croissants before commencing the 200km Rallye. About 300 classic cars enter this rally and tour the Charente countryside along roads lined by cheering bystanders. The route takes you past castles and manor houses, through century old forests and vineyards bordering the river Charente with checkpoints & refreshment stops along the way, and a gourmet lunch is included. On Sunday, the highlight of the weekend. We take a scenic run to Angouleme, (just 40 minutes drive away), to experience the excitement of this historic road race when the whole town becomes one enormous classic car meet with displays of classic cars. Tour the paddocks and watch the racing from your reserved seat in one of the Grandstands. Car Parking is reserved in the centre of town and at mid day join us in a traditional French Bistro, so that you enjoy lunch and then return to your Grandstand seat in time for the racing. Monday morning, a private tour of Chateau Chesnel has been organised,when the resident owner, the Comtesse du Rouffignac will give you a guided tour of her beautiful home, followed by a Cognac & Pineau tasting. 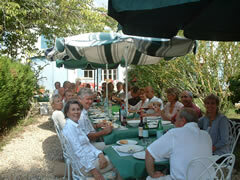 Then return to La Rose des Vents, to join local classic car enthusiastes for our traditional 4 course lunch with apertifs and wine served in the garden. The rest of the week is free for you explore the area – a range of prepared scenic runs are available to explore this beautiful area, and Cognac, Saintes, La Rochelle, Royan and Bordeaux are all within easy reach.